So much has been said and written about the Beatles — and their story is so mythic in its sweep — that it’s difficult to summarize their career without restating clichés that have already been digested by tens of millions of rock fans. To start with the obvious, they were the greatest and most influential act of the rock era, and introduced more innovations into popular music than any other rock band of the 20th century. Moreover, they were among the few artists of any discipline that were simultaneously the best at what they did and the most popular at what they did. Relentlessly imaginative and experimental, the Beatles grabbed a hold of the international mass consciousness in 1964 and never let go for the next six years, always staying ahead of the pack in terms of creativity but never losing their ability to communicate their increasingly sophisticated ideas to a mass audience. Their supremacy as rock icons remains unchallenged to this day, decades after their breakup in 1970. Even when couching praise in specific terms, it’s hard to convey the scope of the Beatles’ achievements in a mere paragraph or two. They synthesized all that was good about early rock & roll, and changed it into something original and even more exciting. They established the prototype for the self-contained rock group that wrote and performed its own material. As composers, their craft and melodic inventiveness were second to none, and key to the evolution of rock from its blues/R&B-based forms into a style that was far more eclectic, but equally visceral. As singers, both John Lennon and Paul McCartney were among the best and most expressive vocalists in rock; the group’s harmonies were intricate and exhilarating. As performers, they were (at least until touring had ground them down) exciting and photogenic; when they retreated into the studio, they were instrumental in pioneering advanced techniques and multi-layered arrangements. They were also the first British rock group to achieve worldwide prominence, launching a British Invasion that made rock truly an international phenomenon. What the Beatles had done was take the best elements of the rock and pop they loved and make them their own. Since the Quarrymen days, they had been steeped in the classic early rock of Elvis Presley, Buddy Holly, Chuck Berry, Little Richard, Carl Perkins, and the Everly Brothers; they’d also kept an ear open to the early ’60s sounds of Motown, Phil Spector, and the girl groups. What they added was an unmatched songwriting savvy (inspired by Brill Building teams such as Gerry Goffin and Carole King), a brash guitar-oriented attack, wildly enthusiastic vocals, and the embodiment of the youthful flair of their generation, ready to dispense with postwar austerity and claim a culture of their own. They were also unsurpassed in their eclecticism, willing to borrow from blues, popular standards, gospel, folk, or whatever seemed suitable for their musical vision. Producer George Martin was the perfect foil for the group, refining their ideas without tinkering with their cores; during the last half of their career, he was indispensable for his ability to translate their concepts into arrangements that required complex orchestration, innovative applications of recording technology, and an ever-widening array of instruments. Hard as it may be to believe today, the Beatles were often dismissed by cultural commentators of the time as nothing more than a fad that would vanish within months as the novelty wore off. The group ensured this wouldn’t happen by making A Hard Day’s Night in early 1964, a cinéma vérité-style motion picture comedy/musical that cemented their image as “the Fab Four”: happy-go-lucky, individualistic, cheeky, funny lads with nonstop energy. The soundtrack was also a triumph, consisting entirely of Lennon-McCartney tunes, including such standards as the title tune, “And I Love Her,” “If I Fell,” “Can’t Buy Me Love,” and “Things We Said Today.” George Harrison‘s resonant 12-string electric guitar leads were hugely influential; the movie helped persuade the Byrds, then folksingers, to plunge all out into rock & roll, and the Beatles (along with Bob Dylan) would be hugely influential on the folk-rock explosion of 1965. 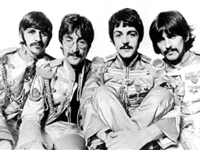 The Beatles’ success, too, had begun to open the U.S. market for fellow Brits like The Rolling Stones, the Animals, and The Kinks, and inspired young American groups like the Beau Brummels, Lovin’ Spoonful, and others to mount a challenge of their own with self-penned material that owed a great debt to Lennon-McCartney. For the past couple of years, live performance had become a rote exercise for the group, tired of competing with thousands of screaming fans that drowned out most of their voices and instruments. 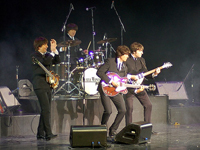 A 1966 summer worldwide tour was particularly grueling: the group’s entourage was physically attacked in the Philippines after a perceived snub of the country’s first lady, and a casual remark by John Lennon about the Beatles being bigger than Jesus Christ was picked up in the States, resulting in the burning of Beatle records in the Bible belt and demands for a repentant apology. 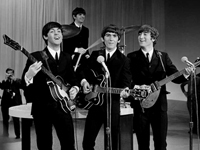 Their final concert of that American tour (in San Francisco on August 29, 1966) would be their last in front of a paying audience, as the group decided to stop playing live in order to concentrate on their studio recordings. The final blow, apparently, was the conflict between the release dates of Let It Be and McCartney’s debut solo album. The rest of the group asked McCartney to delay his release until after Let It Be; McCartney refused and, for good measure, was distressed by Spector’s post-production work on Let It Be, particularly the string overdubs on “The Long and Winding Road,” which became a posthumous Beatles single that spring. Although McCartney received much of the blame for the split, it should be remembered that he had done more than any other member to keep the group going since Epstein’s death, and that each of the other Beatles had threatened to leave well before McCartney’s departure. With hindsight, the breakup seemed inevitable in view of their serious business disagreements and the growth of their individual interests. Yet within a short time, it became apparent both that the Beatles were not going to settle their differences and reunite, and that their solo work could not compare with what they were capable of creating together. The stereotype has it that the split allowed each of them to indulge in their worst tendencies to their extremes: Lennon in agitprop, Harrison in holier-than-thou mysticism, McCartney in cutesy pop, Starr in easy listening rock. There’s a good deal of truth in this, but it’s also important to bear in mind that what was most missing was a sense of group interaction. The critical party line often champions Lennon as the angry, realist rocker, and McCartney as the melodic balladeer, but this is a fallacy: each of them was capable, in roughly equal measures, of ballsy all-out rock and sweet romanticism. What is not in dispute is that they sparked each other to reach heights that they could not attain on their own. Despite periodic rumors of reunions throughout the 1970s, no group projects came close to materializing. It should be added that the Beatles themselves continued to feud to some degree, and from all evidence weren’t seriously interested in working together as a unit. Any hopes of a reunion vanished when Lennon was assassinated in New York City in December 1980. The Beatles continued their solo careers throughout the 1980s, but their releases became less frequent, and their commercial success gradually diminished as listeners without first-hand memories of the combo created their own idols. Legal wrangles at Apple prevented the official issue of previously unreleased Beatle material for over two decades (although much of it was frequently bootlegged). The situation finally changed in the 1990s, after McCartney, Harrison, Starr, and Lennon’s widow, Yoko Ono, settled their principal business disagreements. In 1994, this resulted in a double CD of BBC sessions from the early and mid-’60s. The following year, a much more ambitious project was undertaken: a multi-part film documentary, broadcast on network television in 1995, and then released (with double the length) for the home video market in 1996, with the active participation of the surviving Beatles.